I don't type. I peck and find. I don't have letter writing skills. This is a major accomplishment to even attempt an email. 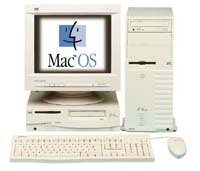 My first Mac isn't even mine!. It isn't even really a Mac! It's my daughters Umax SuperMac C500. It's old now, and she operates it well. Getting a computer for her was just a "hope" at our home. We had suffered financially, had serious health problems, and day to day life was a struggle. It didn't take much money, and with the help of other family members we got our computer! We listened to the advice of all the new computer stores and stayed confused! I should have been better prepared. To make a long story short, in my searching I actually ran across an honest salesperson! He worked in one of those new age computer monster stores. He pushed their product elegantly! It had every bell and whistle! It was super duper gigabyting, video zip-zapping, overlapping, underwriting, color phasing internet eating and totally fail-safe! It was warranted, guaranteed and customer service free. After hearing his spiel. I asked him "What kind of computer do you personally own"? He leaned over and said "Macintosh." I was sold! I left and looked for a Macintosh dealer! Well, I found them, and they were out of my price range. But they got me a Mac clone, monitor, and color printer! They even peaked my memory a little and gave me the latest operating system for that time. The computer's old now. My daughter has graduated high school. It's memory is loaded. It's online. A microphone and quickcam have been added. Now it teaches me through it's built-in manuals and online! My daughter has her eye on something called a G4 and is working daily to buy it! She has her own laptop - something Mac. Mom and I, are still using our first Mac. It's old and slow, just like us! It's perfect! Recently Mom has started a new hobby: Finding old Mac's in the yard sales! She bought two for pocket change, an LC 550 (Internet ready!) and a IIci, both working magnificently! What I'll do with them. I haven't any idea. I don't know much about computers, but we know there's only one computer: Macintosh.